This outstanding example of a 2019 Toyota Prius XLE is offered by Kendall Toyota Alaska. This Toyota includes: REAR BUMPER APPLIQUE (PPO) 50 STATE FEDERAL EMISSIONS *Note - For third party subscriptions or services, please contact the dealer for more information. * Save money at the pump with this fuel-sipping Toyota Prius. No matter the weather conditions or terrain, this Classic Silver Metallic AWD Toyota Prius handles with an elegant confidence. Fine interior appointments complement this vehicle's unprecedented performance. This is the one. Just what you've been looking for. This outstanding example of a 2019 Toyota Prius XLE is offered by Kendall Toyota Alaska. This Toyota includes: REAR BUMPER APPLIQUE (PPO) SPECIAL COLOR 50 STATE FEDERAL EMISSIONS *Note - For third party subscriptions or services, please contact the dealer for more information. * Stylish and fuel efficient. It's the perfect vehicle for keeping your fuel costs down and your driving enjoying up. No matter the weather conditions or terrain, this Blizzard Pearl AWD Toyota Prius handles with an elegant confidence. Fine interior appointments complement this vehicle's unprecedented performance. Look no further, you have found exactly what you've been looking for. 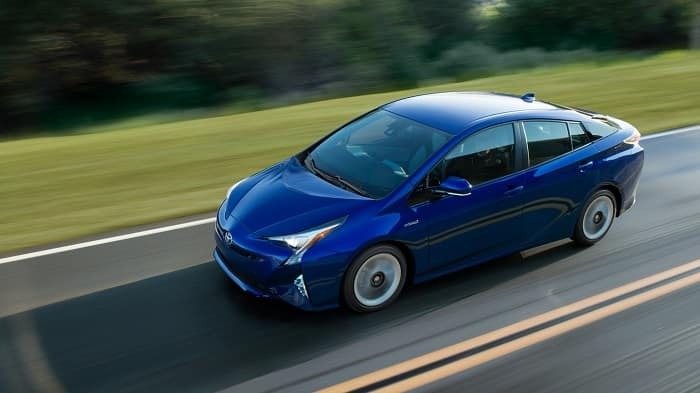 If you’re looking for a new Toyota car that’s stylish, affordable and reliable but also puts you at the forefront of automotive environmentalism, why not go for the vehicle that’s synonymous with “green?” As the most popular hybrid vehicle on the market for years, the Toyota Prius only gets better with age. Now available in a variety of different sizes and variations, the Toyota Prius continues to take the hybrid auto world by storm with each passing model year. Here at Kendall Toyota of Anchorage, your trusted local Anchorage Toyota dealership, we’re confident you’ll find nothing lacking when you’re behind the wheel of the new Toyota Prius. Ready to get your green on by taking the Toyota Prius home with you? The team here at Kendall Toyota of Anchorage would be more than happy to assist you in that endeavor! When you stop by our Toyota dealership’s convenient location at 6930 Old Seward Highway in Anchorage, AK, you’ll be able to get behind the wheel of the Toyota Prius so you can make up your own mind about whether or not it’s the right car for you. Naturally, we’re a little biased, but we’re confident that you’ll fall head over heels in love with the Toyota Prius, so why not prove us wrong-or right? Contact us today with any questions or concerns. The whole team here at Kendall Toyota of Anchorage is looking forward to assisting you in your next new car-buying journey.